My plan for France was to stay in the south, avoiding the fast toll highways while making a fairly direct route for Andorra in the Pyrenees. I was not disappointed with the results! Good paved roads meander through mountains, low hills and rolling pastoral country, interrupted only by small towns and villages where even the most humble roadside cafes offered delicious food and pleasant atmosphere. The motorcyling culture I experienced over the next few days was another unexpected treat. Other motorcyclists would wave or nod. Car drivers would scoot over even in no-passing zones to allow a brisk overtake, and at stoplights would move over to allow lane-splitting to the front of the line. Motorcyclists would raise a boot from a footpeg as a show of thanks. What a change from the ‘road warrior’ traffic mindset of Asia and the Middle East! 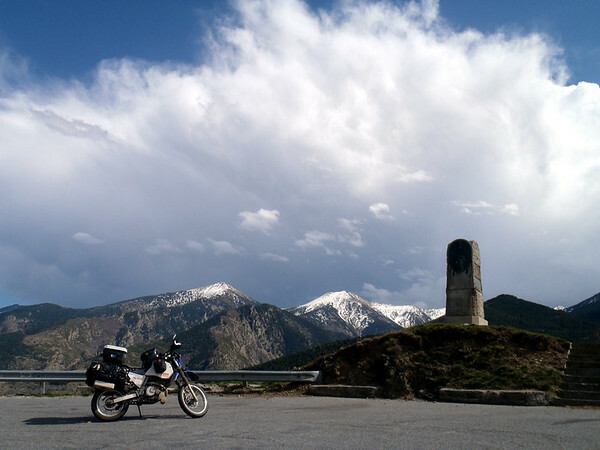 From Perpignan I turned west for Andorra, and the blue skies quickly turned to clouds and chilly mist.. I regret the dearth of photos from the rest of France. Higher still in the Pyrenees. The roads in the French Pyrenees were some of the finest I’d ever ridden. I was too busy grinning like an idiot to stop for a few photos, so here are someone else’s. Although tiny, Andorra is a scenic nation high up in the eastern Pyrenees. Or so I’m told! For the three hours I spent riding through the country, most of the time was spent nervously navigating through pea soup fog on wet, twisting roads. The few vistas that were clear afforded views of towering mountains, tall slender evergreens, and empty ski lodges of stone and dark stained wood. 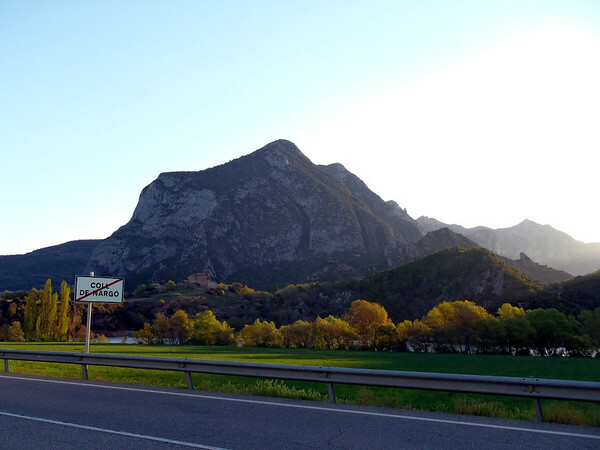 I breezed through the border with Spain, descending to rolling pastureland, stopping for the night at Coll de Nargó. Coll de Nargó, northern Spain. I continued on a westerly course through rolling landscape reminiscent of the high desert of New Mexico, with low pine trees dotting the undulating grassy countryside. In the distance I spotted a walled old town, flipped a coin in my head and decided to have a look. 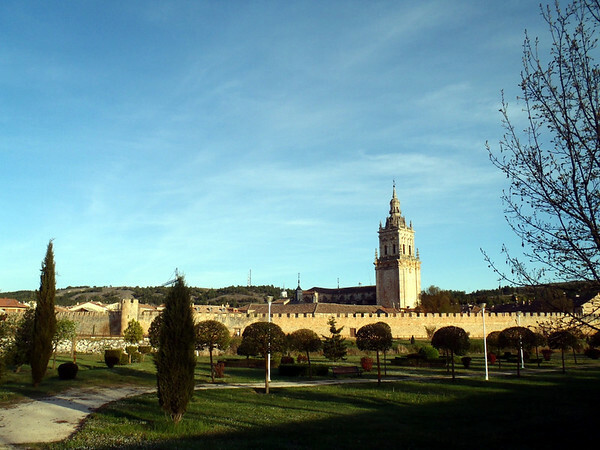 Burgo de Osma from the highway, on the banks of the Rio Ucero. I quickly found a friendly, 3-star hotel with underground parking, and spend the late afternoon strolling the cobblestone streets. 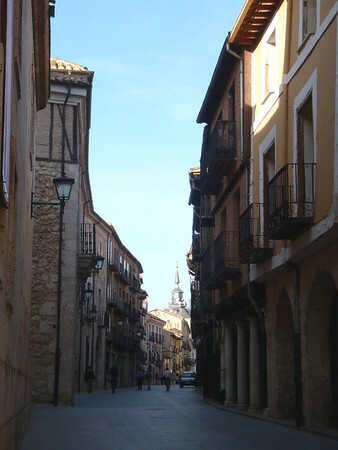 Streets of the old city of Burgo de Osma. I found the city very enjoyable and the locals friendly, so I stayed for two nights, resting my rear and throttle hand, catching up on laundry and emails. 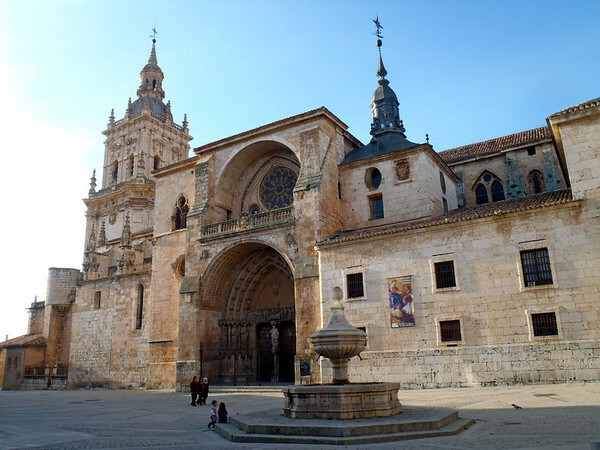 Cathedral of Burgo de Osma, begun in 1232, completed in 1784. 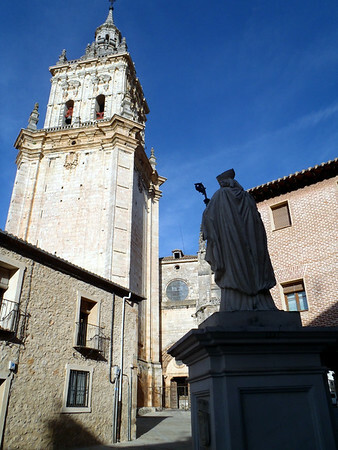 Statue of Pedro de Bourges (San pedro de Osma). Another view of the fine cathedral. Lots of "local" tourists were spending a lazy afternoon sipping wine and chatting on the plaza. 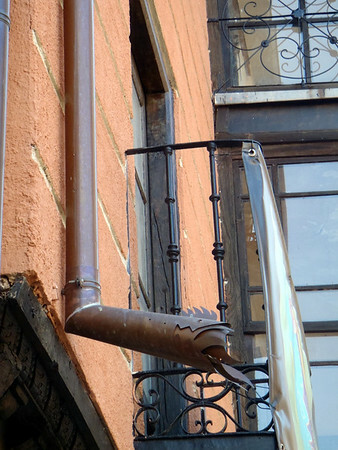 Even the smallest architectural details such as this downspout were given an artistic touch. While in Burgos I’d made contact with a shipping company to see about air freighting the bike from Madrid, only a few hours to the south. They told me it would be a few days before they could work up a quote, so I made my way to Madrid, landing in an overpriced, sprawling hotel near the airport (with the aim of expediting the shipping process). I passed the next few days in the malaise I’d felt in Aswan: no urge to see the sights, weary of being in the thick of the tourist trade, and getting cranky about being in a holding pattern. Finally, after several days, the shipping company emailed me a quote…for sea freight! I was really fuming at this point, a combination of wasting money waiting for a useless shipping quote and beat from traveling for 9 months. I made a beeline for Lisbon, making it in two easy days, and from there sent emails to several freighting companies inquiring about shipping to the east coast of the US. 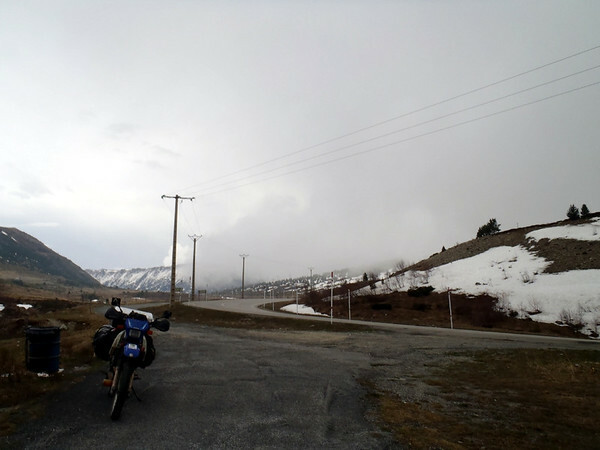 The next day I had a reply from an agent who was himself a motorcyclist. Like nearly every other Portuguese person I met, he was friendly and helpful, and spoke very good English, sparing me the embarrassment of fumbling their language. In the intervening evenings I took to walking the portion of the city within a few dozen blocks of the hotel, finding small cafes to lurk in, and with a small victory dance discovered a sushi joint offering good variety and quality at a decent price. On the appointed day I rode to the freighter’s warehouse in the industrial district, peeled off my riding gear and left it all in a pile near the bike. They promised to box it up and include it in the crate. I took a last look at my trusty, dirty bike, parked next to blue drums destined for Angola. It was hard (and a little sad) to believe that the next pavement that the tires would touch would be in the USA. #1 | Written by Jeff about 8 years ago.